Ah yes, the age old struggle of Henry and bitting. It’s been difficult from the very beginning, back in the days when he completely ducked behind all contact and I ended up taking the bit of the equation completely for 6 months. Since I added the bit back in, we’ve gone through several. Some were just because he’s matured and developed over the years, and his ability to handle and go into contact has improved. We’ve gone from a copper loose ring to a nathe to an eggbutt french link to a baucher to Myler to a happy mouth to a KK – different mouthpieces, different metals, different rings, and different thicknesses. Some he hated, some he liked well enough… I’ve never found one where I really loved how he felt in it. I really felt like that was the horse, though, not the bit. The Neue Schule bits have been on the scene for a while now, and I’ve heard really good things about them. There’s no getting around it: they’re expensive. Especially for someone like me, who has a horse that is very high drama and dislikes most things. His history with bitting tells me that he either tolerates it, or he wants me to stick it where the sun don’t shine and take it with me to hell. That’s Henry. He was also going “fine enough” in his KK that he’s been wearing for a few years now. I mean, sure, sometimes he still liked to drop the contact and come behind the bit, or bounce up off it, but I had no problem accepting that those were symptoms of training issues or my own riding. He’s never been a big fan of real contact and connection, and dressage isn’t my strong suit. And then I had a day where I really was feeling meh about how he was going in the KK, and started wondering if it might be time to move on again. Maybe a different metal, or a thinner KK? Back to the Nathe? I wasn’t sure. By sheer luck, I also noticed that Riding Warehouse had started carrying some of the Neue Schule bits. There are a lot of things I can resist, but an experiment with an item that I’ve heard so many good things about isn’t one of them. Maybe I’m dating myself, but I will never see him as anything but Dawson. Also let’s all agree that Pacey was way better. The first question was: which one? Neue Schule has so many options, the indecision was crippling. I posted in a dressage group asking for opinions, and eventually found my way to a rep. She helped me narrow it down to two, and then I completely opted out of making hard decisions and made my trainer pick. Yes I’m that kind of person. 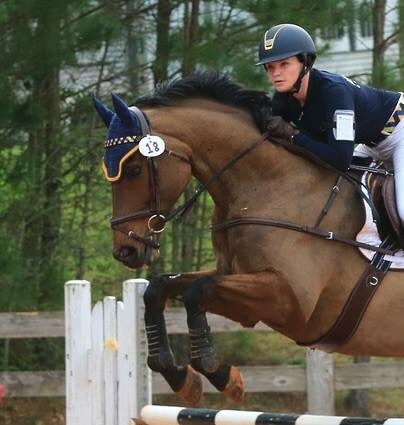 We (she) settled on the Tranz Angled Lozenge Eggbutt, which was described by Neue Schule as “offers stability within the mouth, making it a good choice for horses with inconsistent contact, short, tense necked horses, and horses that need directional control.“. Inconsistent contact and tense necked horse… that definitely sounded familiar. Their website goes on to say “When a contact is taken, the Tranz Angled Lozenge rolls down onto the centre of the tongue, the ‘sweet spot’, enhancing feel and responsiveness thus a higher level of communication through the rein is achieved. The arms are slightly curved and of an oval profile. This oval design takes up less room between the tongue and upper palate, whilst offering a similar weight bearing surface from the pony’s perspective as thicker, circular mouthpieces.“. I know that Henry has a larger than average tongue and lower than average palate, so again… this sounded pretty spot on for him. In all of my reading I found that Neue Schule really spent a long time researching and developing these bits. There is a lot of engineering here, and a lot of attention to minute detail, all the way from the exact shape of the bit, to the exact angle of the lozenge, to the exact makeup of the metal. Seeing all the science and engineering that went into them kind of made the price point make more sense. This isn’t your crappy run of the mill $25 loose ring. They spent a lot of time and money developing these. Seriously, take a few minutes to look through all of the information on their website. It’s fun. Admittedly though, at the end of the day all the science in the world can be as impressive as it wants, but what really matters is – what does the horse think? I will start by saying that Henry hates change. He always has. Any new piece of equipment tends to get a reaction somewhere between angry and irritated. He is the Princess and the Pea to an extreme. Knowing this about him, I planned for the first ride in the Neue Schule to just be a walk hack, ponying Presto with us. No contact or anything, I just wanted him to carry the bit and get used to a new feel in his mouth. As expected, he chomped and chomped and chomped the entire time, trying to figure it out. Standard behavior for Henry on day 1 of a bit change. The next day I put him back in it, and went out to do trot sets. On trot set days we work mostly in stretchy trot, just going forward and straight, adding in some hill repeats. I didn’t ask him to do anything but go forward and relax his topline, so he could work up into some contact but not really make it too “formal”. The third day was when I knew I’d be able to tell whether or not it was going to work. By the third repetition he’s always over the fact that Something Changed, and we’ve either moved into acceptance or rejection. So for day 3 we went out and did a light dressage ride, and I suddenly had a horse that was quiet and much steadier in the contact. He didn’t chomp at all (chomping is his go-to maneuver and always has been, I don’t think we’ve ever gone a whole ride in any bit with no chomping), and he felt steadier in my hands than he ever has. The next day, same thing, but even better. The following day, same thing, but even better. I described it to Trainer the best way I could, saying that he felt more “mature” in the connection. Steadier, moving up TO the bit, and no chomping. I finally felt like I had something solid to ride him up to. Only two weeks have passed between the first photo in this post and this one. The difference? A bit change. In truth, this bit fits the shape of his mouth so much better than the KK, and better than anything else I’ve used on him. It sits so nicely, not too thick, not too thin, and matches the contours of his mouth perfectly. 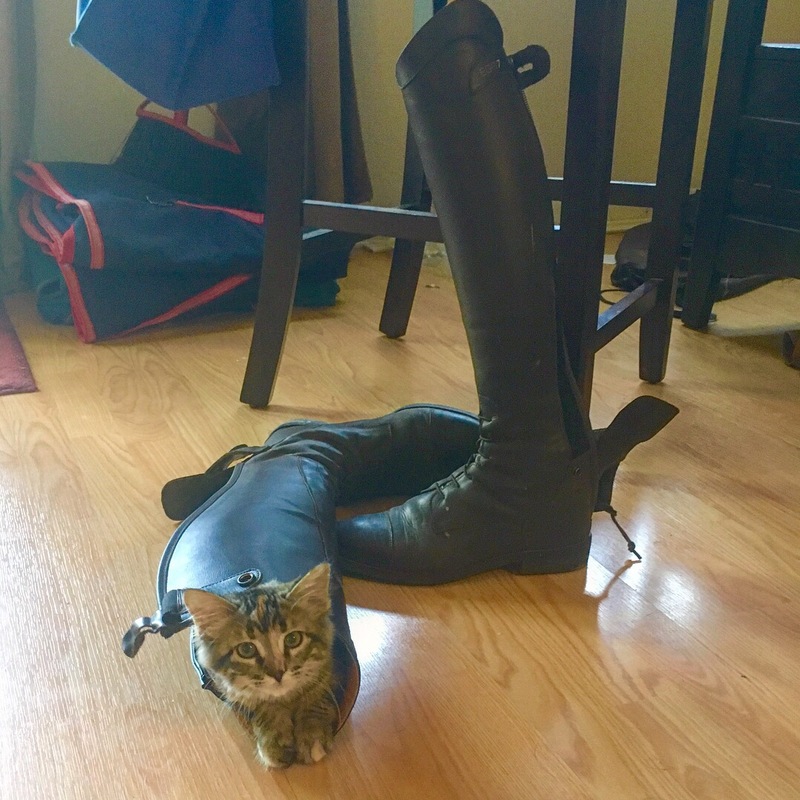 I can see why he finds it so much more comfortable. I think I had fallen into the “bit fitting” trap of looking only at the size and thickness of the bit, rather than really examining the whole shape. Bits are kind of like saddles in that way – it has to fit the whole way across. Until I saw how well the Neue Schule sat in his mouth, I didn’t really realize how all of the others hadn’t. The difference in his hind leg is unbelievable! The connection can finally come from back to front with a soft, elastic connection to the bit. Before, he would hit the bit and try to hide from it, and that tendency has totally disappeared. He finally trusts the contact, which results in a true connection, which results in a horse that can work properly forward from his hind end. I am still kind of blown away by the difference. I was hoping he would like the bit, but I didn’t really expect to have any major changes. In my wildest dreams I was thinking maybe he’d be 20% steadier in the contact, but instead I’ve got a horse who is 100% happier than he was, and some issues that we’ve struggled with for years have been massively improved in a matter of weeks. Now I feel bad for taking so long to figure this out for him. 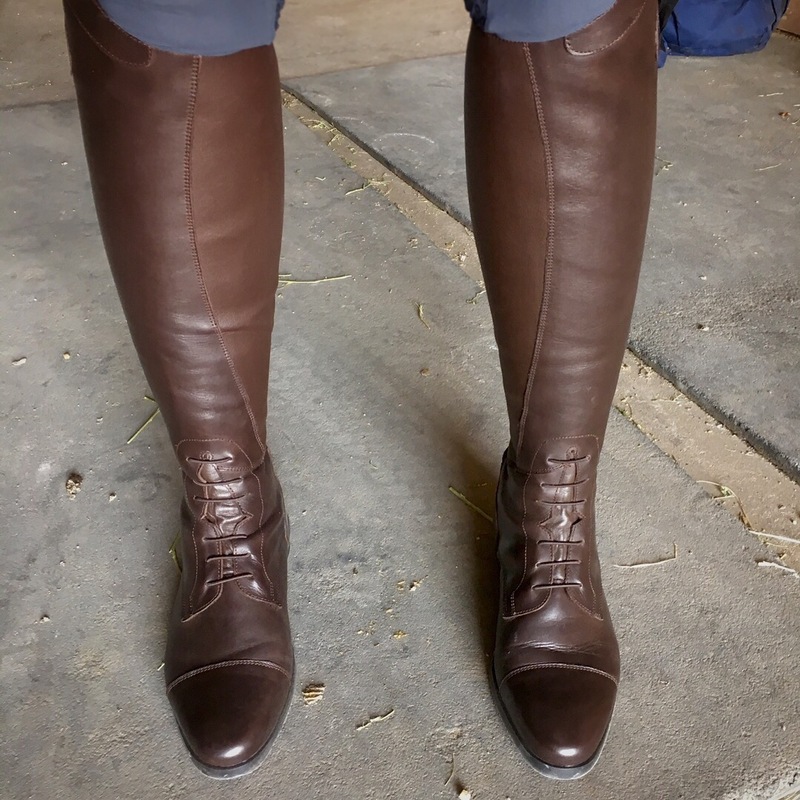 If you’ve been eyeing a Neue Schule, I really can’t say enough good things about my experience. Are they pricey? Yes. 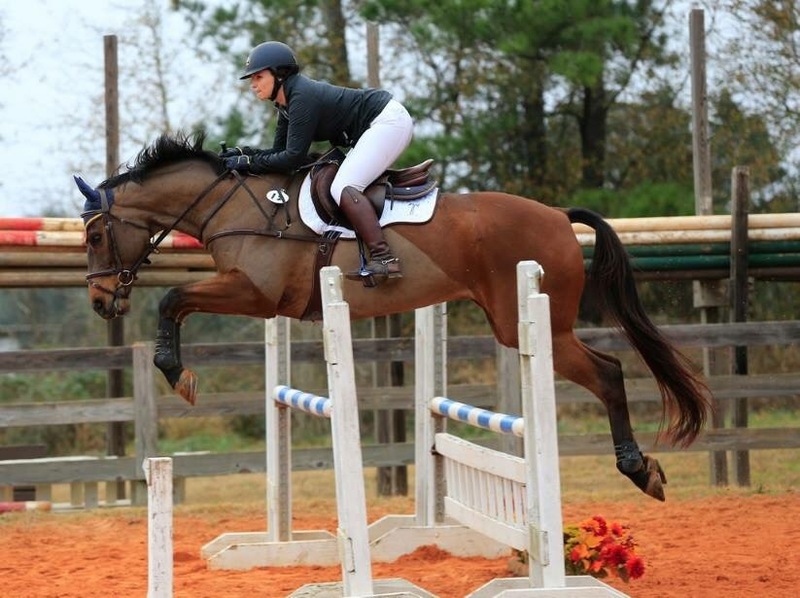 Would I have spent the money several times over to make my horse this much happier? Without a doubt. 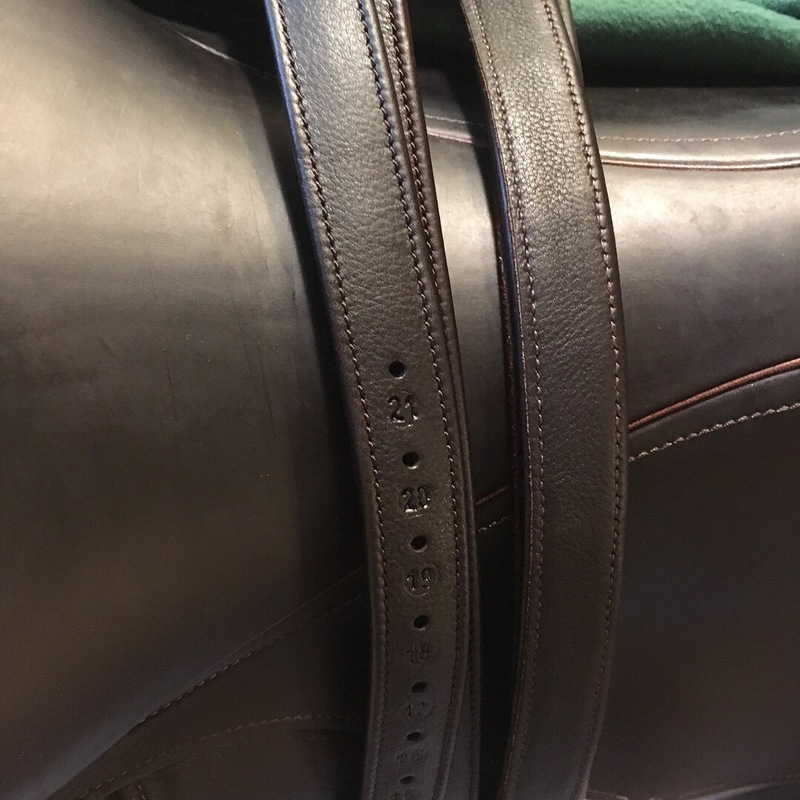 Bits are just as important as saddles, IMO, and you can’t deny all of the time and engineering that has gone into producing the Neue Schule line. You also can’t argue with Princess Henry. I do always have Riding Warehouse coupons, so if you’re looking to save a few bucks on an order just drop me a line and I’ll send you one. I know every dollar counts! And in this case, those dollars are exceptionally well spent. If you’ve read any of my past breech reviews, you guys know that I am a big fan of the Ovation Aqua-X breeches. They’re comfortable, they’re flattering, and they’re super affordable. They’re also very lightweight and cool, which is what I need here in Texas for at least 9 months of the year. But when we started talking about doing some foxhunting and I realized I needed to buy a pair of tan breeches (I am so completely assimilated as an eventer now that I legit did not have tan breeches anymore), I figured I should opt for something with a thicker fabric. Foxhunting is generally a cooler weather sport, after all. So I reached out to my favorite Ovation rep and asked for recommendations. I liked the Aqua-X so much that I decided it was worth giving one of their other models a try. 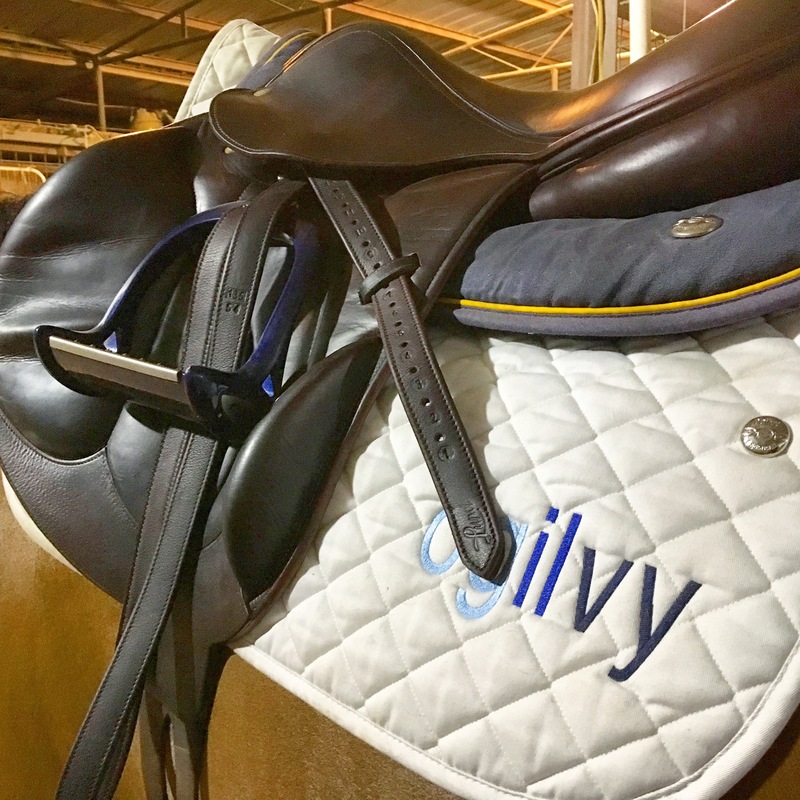 When I described what I was looking for (heavier fabric, but not an actual winter breech… there’s a lot of galloping involved, you warm up fast, and you’re in the saddle for a long time) she immediately recommended the Celebrity Euroweave. I opted for the knee patch with a euro seat, since they were for hunting, in the regular length. The fit isn’t quite as good on me as the Aqua-X (which fit like they were made for me) in that the waist is just a little bit gappy. I have this problem a lot with breeches, since I carry more weight in my hips and thighs. 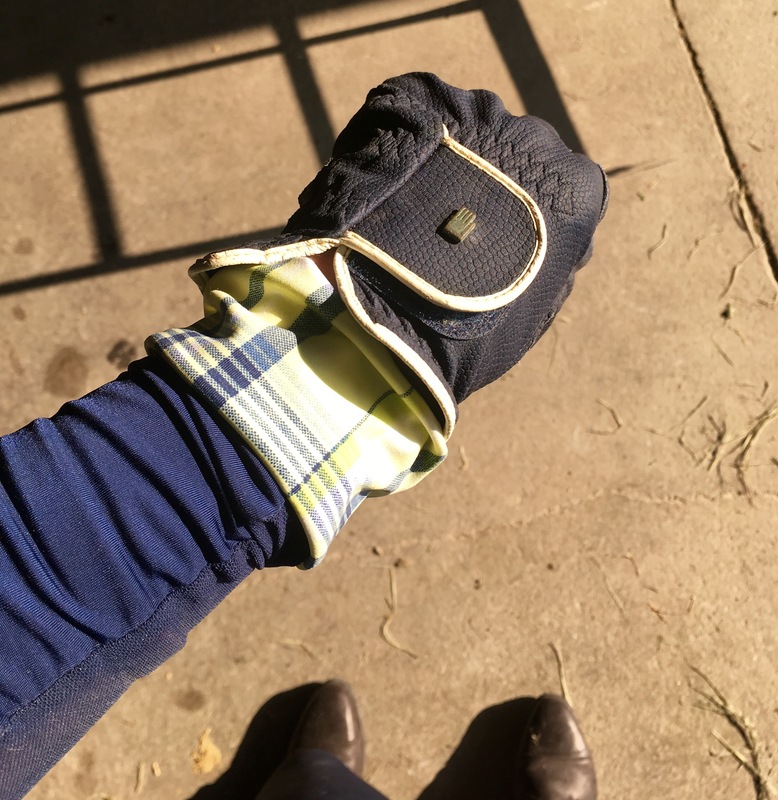 They’re definitely a better fit in the waist than any of the Equine Couture, TuffRider, or Pipers that I’ve tried… the amount of gap is pretty similar to how Tailored Sportsman’s fit me. Other than that, the fit was pretty good, and they were definitely comfortable. They have my ever-coveted sock bottom, which has become a requirement for me, wide belt loops, and some cute piping detail at the pockets. 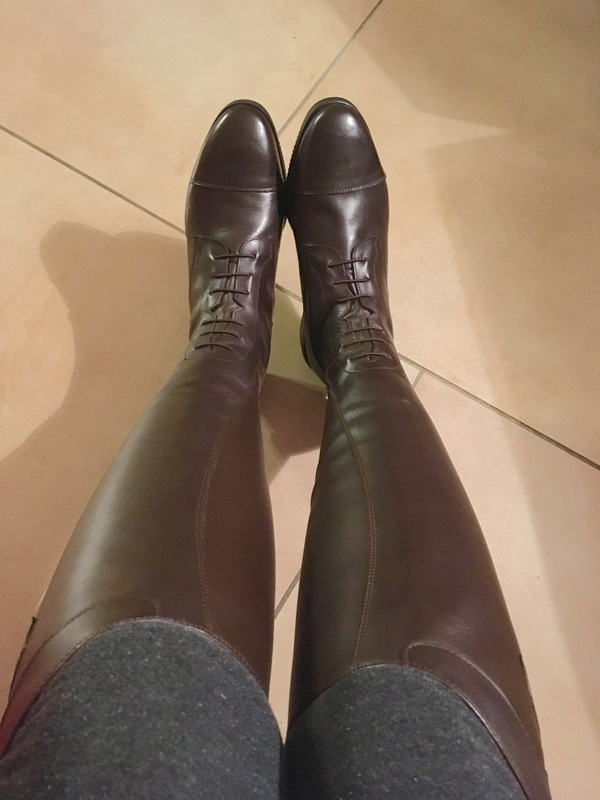 I tried them out for the first time at a tiny schooling show for a couple of dressage classes, and they were quite comfortable. The most impressive thing was how well they washed up afterwards. I am a huge pigpen and seem to just attract dirt, slobber, stains, and general yuck. I just threw these in the regular wash and they came out looking new again. The next test was rolling them out for their intended use – hunting. One of the reasons the rep recommended this particular model was that they have a bit of a stretchier fabric that uses Dry-Tex™ technology to help wick away any moisture, making them a great choice if you’re going to be wearing them for long periods of time. I wore these things for 12 hours that day, 3 of which were mounted, and I never once thought about my breeches. To me that is the ultimate compliment. 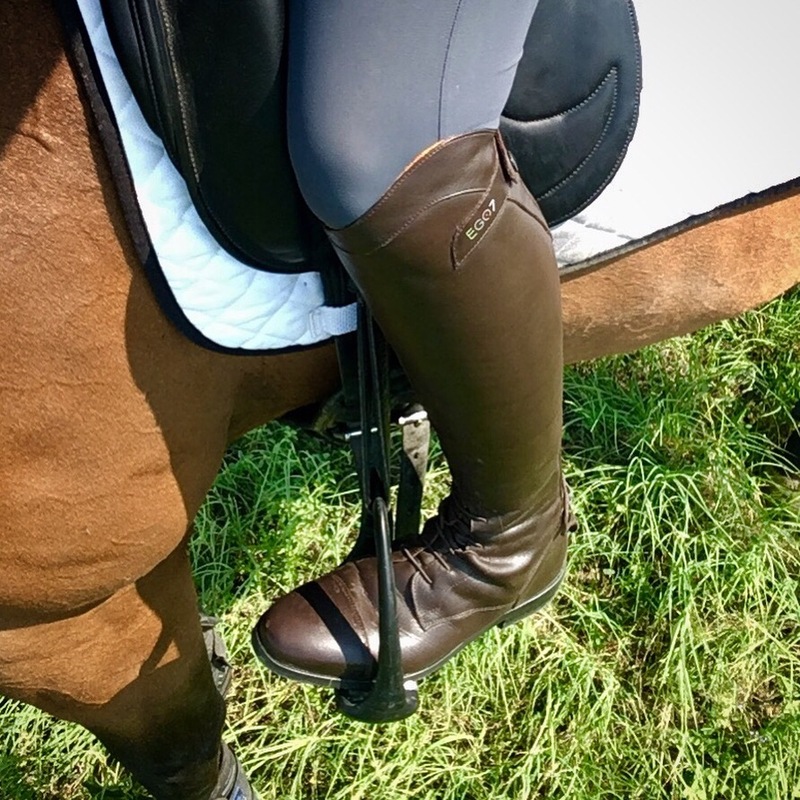 They were super comfortable, and the weight was perfect for galloping around in upper 50’s temps. 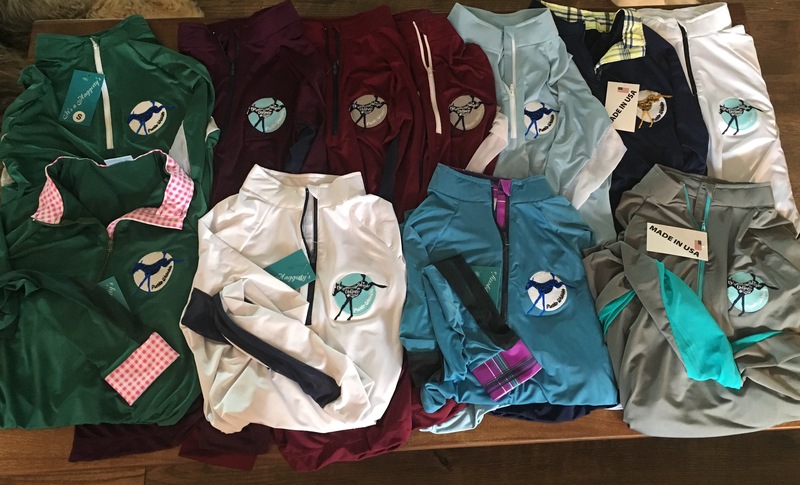 The Celebrity breeches come in knee patch and full seat, tons of color options, and regular and long lengths. At under $100, they’re a pretty solid buy for a cooler weather schooling breech or a mid-weight show breech (see-through, they are not!). Oh, and I did finally take the plunge and order some Aqua-X breeches in full seat. Verdict? I love them! Finally, a pair of full seats that I actually like. We look so legit at our dressage lessons now (j/k, we don’t, but hey at least we’ve got the right wardrobe). I was going to wait another week or so to review these until they’re available online, but a) lots of you have been asking about them, and b) I will probably forget for a while because September is nuts for me. So – doing them now, lest anyone be left wondering when they come out. reasonably spaced holes: either half holes or one inch spacing, because I am really weird about very specific adjustments. I need options. color – gotta match the saddle, yo. I took a leap of faith with the Lund’s, being a new product, but the brand hasn’t led me astray yet AND the leathers ticked all my boxes. Out of the box they’re quite orange, which is fairly typical of nice calfskin in it’s brand new, pre-oiled state. The question is always whether or not they’ll take oil and darken well. Boy did these pass THAT test! Two coats of oil and they were butter soft and perfectly matched to the Devoucoux. As with all of my other Lund gear, the leathers are really well made and well constructed. 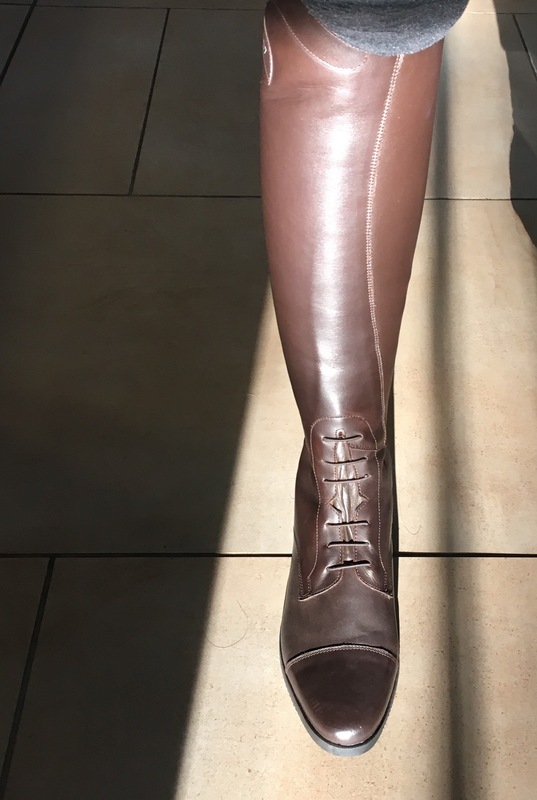 There has been no stretch or wear so far in the first couple months of use, and they look just gorgeous. So far, two thumbs up. The leathers are supposed to be available online hopefully next week (I’m sure if you want them badly enough they could put you on a pre-order list, or make sure you’re following them on fb for new product annoucements!) and retail right around $90USD. Considering I was ready to pay $150 for slightly used CWD leathers, I’m quite happy to have gotten my hands on these instead. They’re every bit as nice, but brand new and for a much more reasonable price. 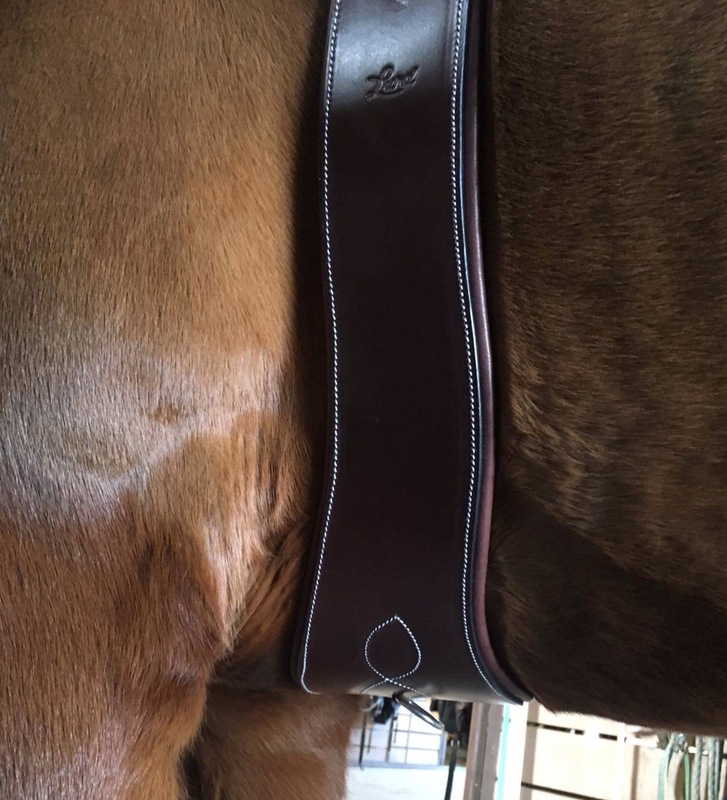 I’m actually really excited about this review, because I think this is one of the best products that Lund Saddlery makes. 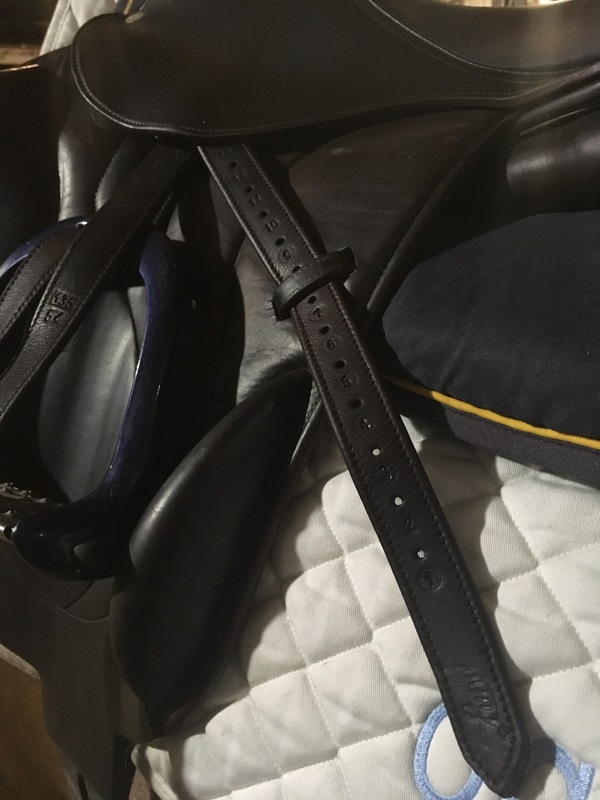 I’m picky about girths (ok maybe Henry is the picky one) and it seems like it’s more and more difficult to find nice ones without spending exorbitant amounts of money. But if you want something budget-friendly that is still beautiful enough for even the fanciest show, these are worth taking a good look at. 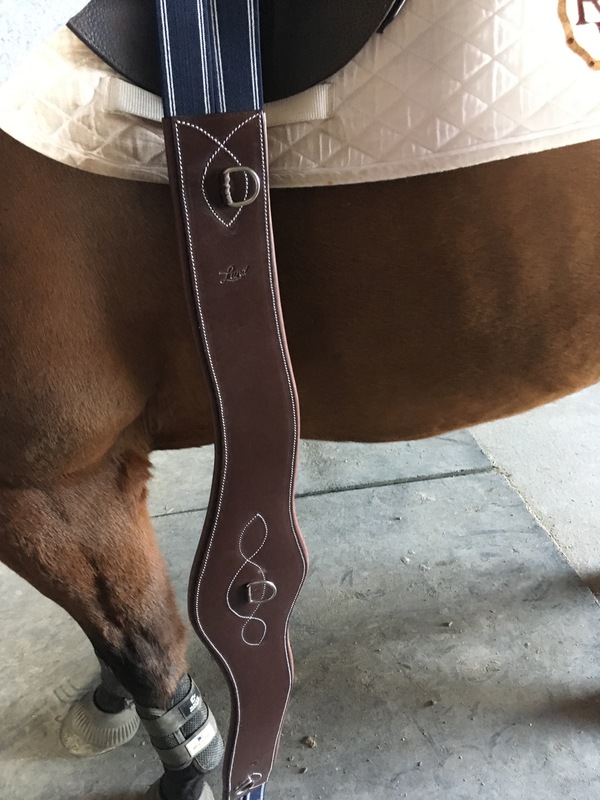 Lund has a few different girth styles that will be hitting the market soon: a regular contour girth, an anatomic girth, and a belly guard girth. I chose the anatomic for Henry, because he’s a princess and will definitely let me know if he feels like a girth is restricting his movement in any way. No one ever believes me when I tell them this, but Henry wears every inch of a 54, and the Lund measured spot on. The sizing is definitely true. Right out of the box the leather looked beautiful, the stitching was perfect, and the padding was nice as soft. I love the attention to detail with the pretty navy elastic on each end, fancy stitching details, dee ring at the center and on each side to clip attachments to, and roller buckles. It ticks all the boxes for the things I want a need a girth to be, and the execution is second to none. I’ve been using it since December, and it has held up really beautifully. A quick wipe with a towel and everything looks brand new again. The stitching is still the same bright white that it was to start with, which is kind of a feat in and of itself considering that I don’t exactly baby my tack. The shape of the anatomic style sits really well on Henry. He seems content in it and I’ve never had any issues with slippage. I like that the shape allows him plenty of room at the elbows, something that he seems pretty sensitive about, and the slightly wider style seems to distribute the pressure over a wider area. 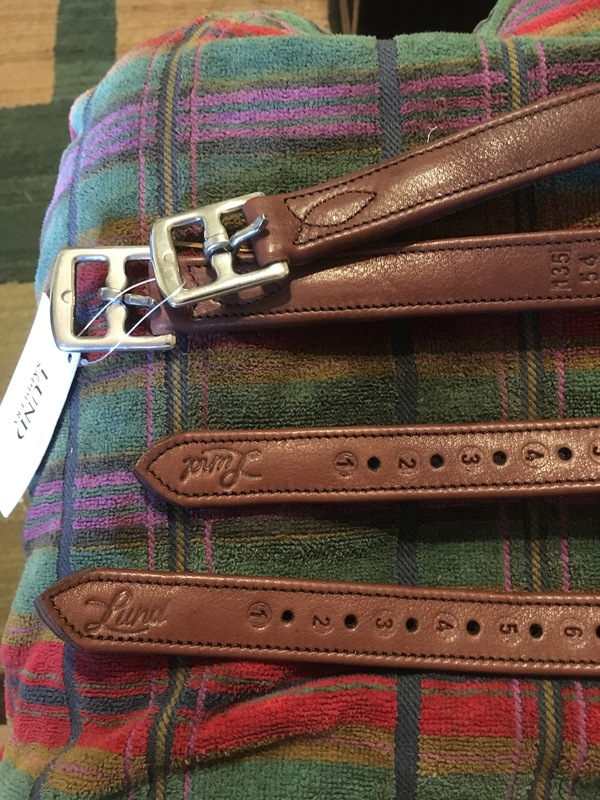 The first run of the girths are COMING SOON to the Lund website, and I think they’ll do really well once they hit the market. As with all of their products that I’ve tried so far, the quality is there and the pricepoint is always more than reasonable. 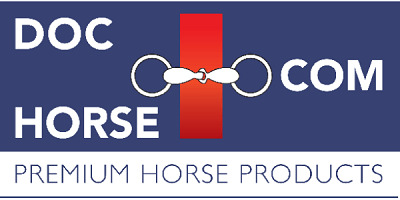 If you’re in the market for a new girth, I would definitely consider adding these to your list! Now I just need them to come out with a monoflap version. Hint, hint. Wink, wink.